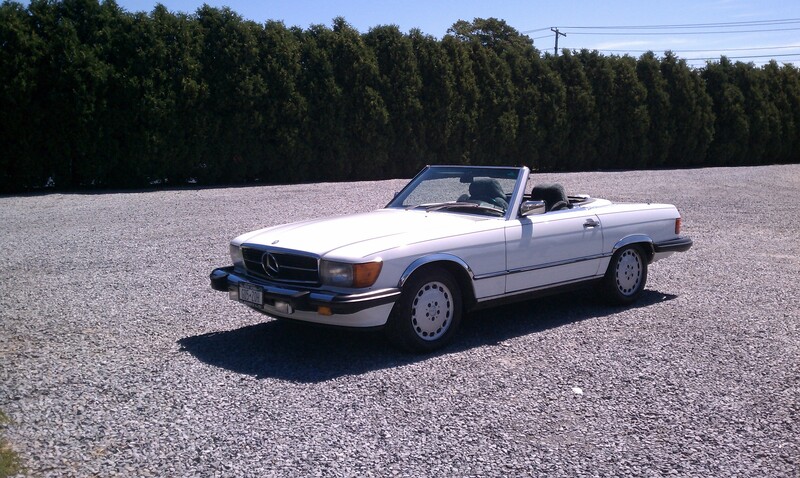 Yesterday, a beautiful, sunny, and breezy day, was perfect for taking the convertible out for a trip around town. As we often do, we headed for Long Island’s beautiful North Fork. We made a few stops first, so by the time we hit wine country on Rt. 25, all we thought about was having some lunch. Yes, we stopped at the Meetinghouse Deli for my favorite house-made turkey sandwich, some potato salad and some potato chips. I believe that no one can have too many potatoes, especially in a variety of forms all served at the same meal. Now, we headed for one of our favorite wineries and picnic stops, Sherwood House, in Jamesport, NY. Besides producing delicious wines, the folks at Sherwood are very picnic-friendly to visitors. With wines by the glass or bottle, a comfortable back deck, shaded picnic tables out front, and a cozy interior for winter jaunts, picnic enthusiasts will feel welcome and enjoy themselves here. We try to get to our favorite wineries, like Sherwood, several times a year. On a past visit, we met the owner of Vines and Branches, and were turned on to some terrific infused olive oil. This time, we discovered Steve, running Jamesport Raw at Sherwood House. 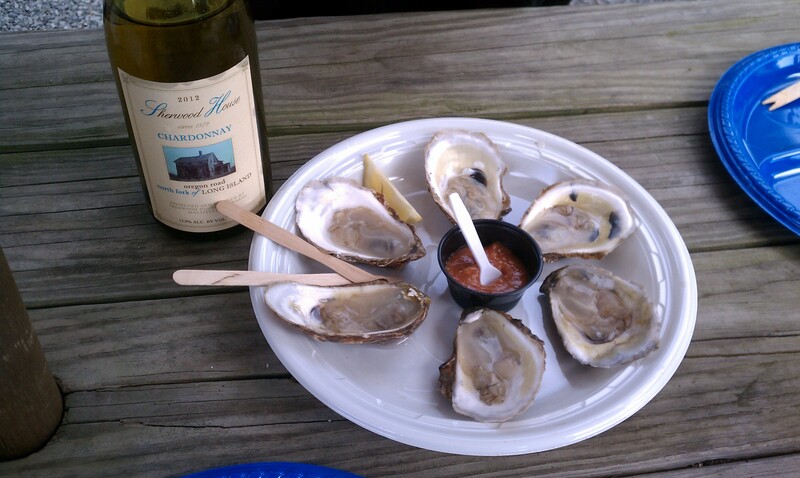 Yes, now some excellent raw oysters, clams, and shrimp are available to enjoy with your wine. 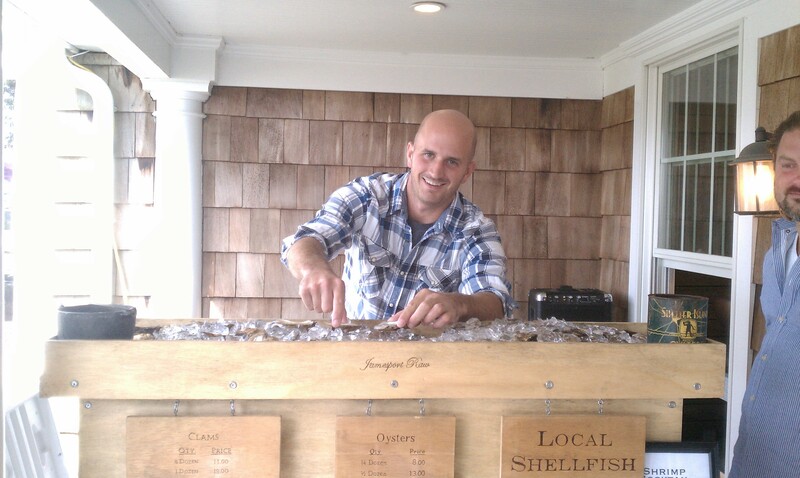 We ordered two plates of freshly shucked Peconic Bay oysters (local stuff # 1). Marian declared them “mind-blowingly good” and I’d have to agree. Briny and bright when sprinkled with some fresh lemon, we slurped them down. Jamesport Raw’s proprietor Steve, pictured above, offered us some cocktail sauce that is his own private mixture. Full of fresh horseradish (local stuff #2), it was also delish, but the oysters needed no help. We found the cocktail sauce went wonderfully on the turkey sandwich, which we were surprised to find had been made with mayo instead of mustard. Fellow picnic-ers enjoyed plates of the freshly shucked clams and shrimp, and made sure we knew they were delicious too. What? No wine? Of course not. We purchased a bottle of the Sherwood House Oregon Road Chardonnay (local stuff #3), which went perfectly with both oysters and turkey. This Chard sees no oak, and is bright with citrus flavor and great acid. At $18.00 a bottle, we loved it with our lunch. We knew we would have to watch the clock, as we had ordered a pair of lobsters for dinner (kinda local stuff #4), to be cooked and packed by Stuart’s Seafood, in Amagansett, NY. 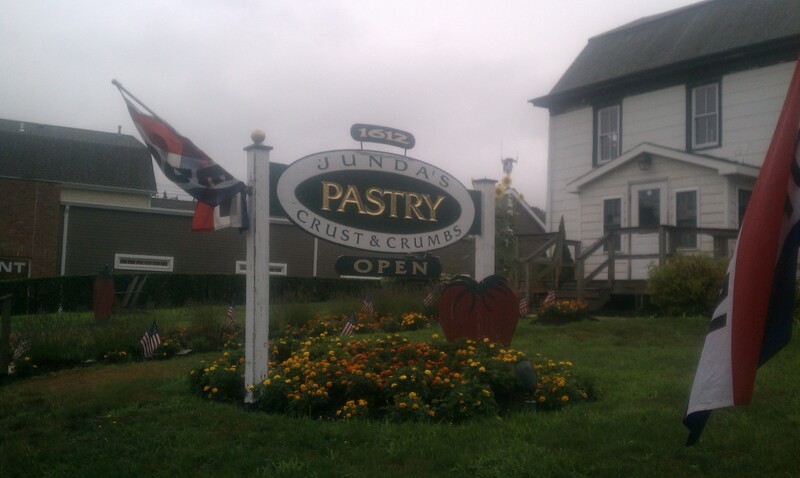 Pickup would be at 6:00 pm, so we headed to Junda’s Pastry Crusts and Crumbs to pick up dessert. One sign of the approach of Fall is the appearance of Pumpkin Pie on bakery menus. Yes we bought a small pumpkin pie (local stuff #5), and headed back to East Hampton, making a few stops along the way. One stop was a Schmidts Farmstand in Laurel, NY for some fresh corn (local stuff #6). 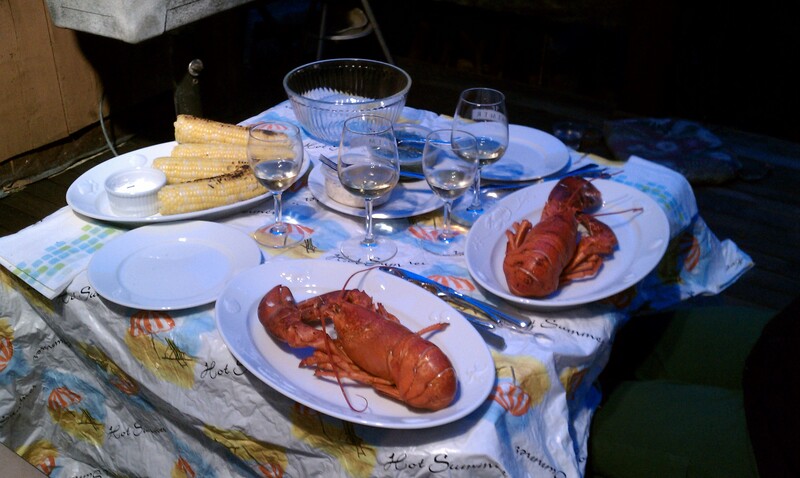 I’ll be grilling that corn as an accompaniment to the lobsters. So dinner would be steamed lobsters, grilled corn, and some delicious yet funky-colored seaweed salad from Stuart’s. No the seaweed is certainly not local, and the color is probably not natural, but we love it anyway. 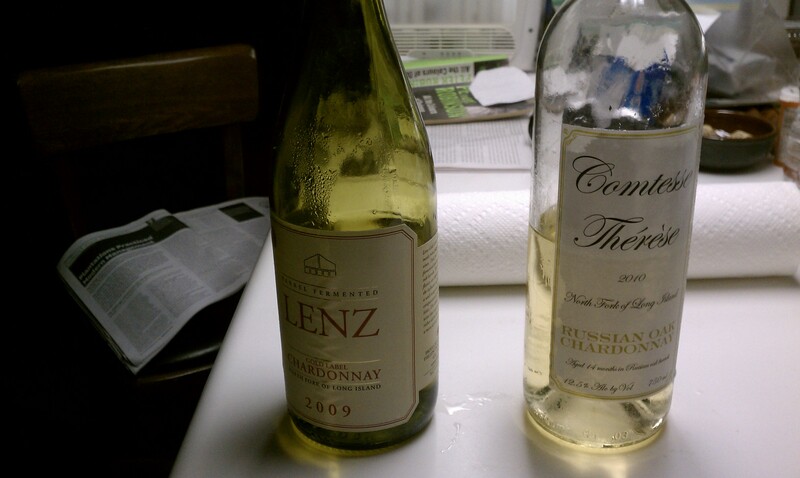 Our question was whether to enjoy a 2009 Lenz Gold Label Chardonnay ($20 per bottle and local stuff # 7), or a 2010 Comtesse Therese Russian Oak Chardonnay ($22.00 per bottle and local stuff #8) with the lobster and corn. No reason to suffer… we opened both and decided to vote with our palates on the winner. Despite the oak it receives, the Lenz was bright and alive with great cut. By contrast, the Comtesse Therese was rich, full of caramel and honey flavors. The Comtesse Therese worked wonderfully with the caramelized grilled corn, and complemented the lobster’s sweetness beautifully. The Lenz woke up our taste buds and provided a brilliant contrast to the lobster. This wine would also be great with some fried seafood, like fried scallops or fried oysters. The photo to your left shows clearly our favorite. Or does it? As you can see, we consumed equal amounts of both wines. We were the clear winners, as these wines were both excellent. Well, not much to say here. After years of trying pumpkin pies from all sorts of local purveyors, last year I finally baked my own. It was not bad. On the other hand, the Junda’s pie was terrific. The pumpkin pie spice mix was evident but not overpowering, and the pie was properly baked. Buy this pie. You will be glad you did. I know we owe you the Lamborgueza story, our terrific breakfast at Star Confectionery, and visits to Coffee Pot Cellars and Laurel Lake Winery. They are coming. Meanwhile, stay tuned, and enjoy your trip around town.